Life is a bit up and down at the moment. We’ve moved house into a rented property, getting reconnected to the digital age (t’internet and telly) pretty painlessly within the first five days. Meanwhile D101 HQ looked like the D-Day landings, which the demolition team in full flow, with a huge hole in the ground where our Garage used to be that stretches into the Garden. Saying that I’m smug that we moved out is an understatement. However its had a huge impact in slowing the impetus of D101. Notice the words ‘slowing’ not ‘stopped’ 🙂 Even though time is even more tight than before I’m still getting D101 stuff worked on, usually at crazy o’clock at night! The Company – Final check in progress, early Oct release. Monkey and OpenQuest are now available in print over at DriveThruRpg.com – Much better quality than Lulu ever produced, and better shipping costs and times. Moving d101’s catalogue over will continue over the next couple of months, but all new books will be via DriveThruRpg.com. My overaim is to have all the D101 developers in a big group shoot with big grins clutching their books at Dragonmeet, where you will be able to buy these new books. This batch of releases is quite significant for D101. It should effectively double or even treble the steady baseline of sales that we get from our current crop of games. Which means the dream of me going full time with this (there’s a D101 office in the new extension 😉 ) takes one huge step forward. So what gentle reader is happening with Monkey, one of the games that has been in ‘production’ forever here at D101 games? This means that the game should be out mid June beginning of July latest. To celebrate I’ve posted a new preview of the game, its introductory chapter. After not releasing any thing since Hearts in Glorantha #3 back in Sept 09, suddenly there’s a whole slew of stuff erupting from the Volcano of Love that is the D101 production que. Monkey (D101-008) Man oh man I’m excited beyond belief. Its in editorial now with the esteemed Mark Galeotti (author of Mythic Russia and ex-HeroQuest line editor, and real life academic journal editor) and going straight into layout once I get it. Master pages are made up, cover is made and I’ve got all my art ready to go once the little monkey boy comes home. Looking at mid-March early April at the latest. Wordplay The Big Five (D101-08) A bit of writing to be done on my part, which could hold things up a tiny bit, but otherwise over half the book (Core +2 out of five themes) already laid out. Aiming for a Con-Quest (see below release) but won’t be surprised if it slips slightly. Its a big book at 250+ pages! Con-Quest is a big milestone for us, alot of stuff that has been lying dormant finally sees the light of day. Gloranthaphiles amongst you will have noticed that there’s a serious absence of Gloranthan releases amongst the treasure trove being unearthed at Con-Quest. This is deliberate. Monkey kept on getting pushed aside for HiG and Savage North was already way over due (it was meant to be an Autumn release). Wordplay:The Big Five just came up suddenly and needs to get out asap otherwise some excellent gaming material ( I’m talking about Mark Galeotti’s The Cold Crusade and Charles Green’s Keep Portland Weird themes here) wouldn’t have seen the light of day. Focus on these books kinda sapped my time to work on Gloranthan stuff. However after Con-Quest is full steam ahead on various HQ releases, both Gloranthan and ‘Gateway’ (Moon Designs term for non-Gloranthan settings). I’ll expand on them later (esp HQ Gateway since I’ve been teasing the community with promises of various things) but for now I shall leave you will a bullet list of stuff you can expect May-July. Cross posted over at the Collective Endeavour, a forum for UK small press RPGs. Monkey: this is the game that will probably interest you lot the most. 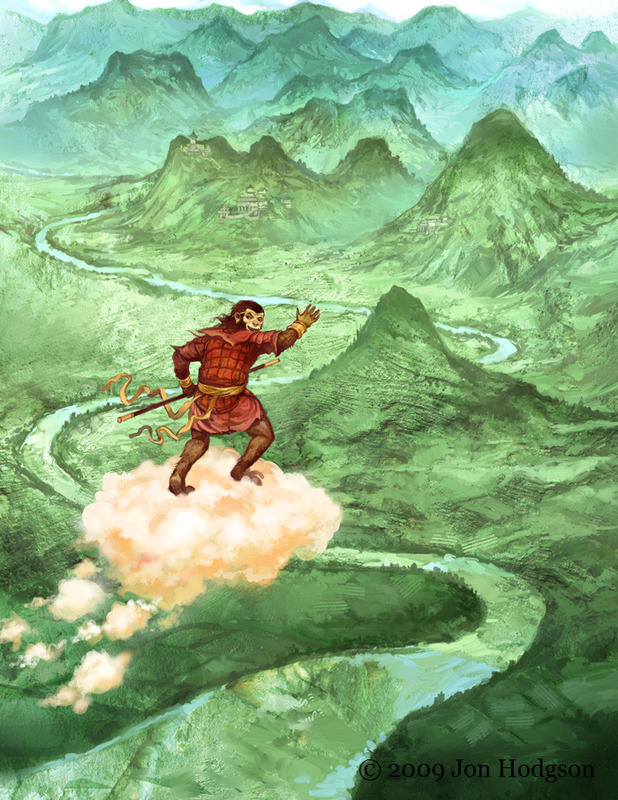 Its my slim & focused 70 page take on the Chinese Classic Journey to the West, better known as MONKEY! over here (thanks to the Japanese TV series that aired in the 80s). Players play errant immortals chucked out of Heaven and the adventures revolve around them trying to earn enough virtue to re-enter Paradise despite their weakness and failings. A simple card mechanic models the action, which is fast furious and comedic while ultimately enlightening. Literally 2 pages away from completion, then a bit of polish, editing, layout and out Feb/March (at the very latest). The Savage North: Last year I released a game called OpenQuest. I took the bull by the horns and produced a totally Open Content game from the Mongoose RuneQuest OGL SRD, which reflects how I like to play D100 (BRP, RQ ) these days, i.e in a very streamlined storytelling manner. The Savage North is a collection of four scenarios set in a Conan like setting. Very trad dungeon bashing/wilderness trekking from the glory days of White Dwarf in the early 80s. A fun little project which I’ve got to work with my mate John Ossoway (author of Cthulhu Rising) who wrote the adventures (for a RQ3 Conan campaign originally), did the copious number of maps and all the art. I’ve been responsible for writing a setting, converting it to OpenQuest and generally gluing together what was initially just a quick fun write up for John’s home group. Wordplay: The Big Five This is Graham Spearing’s D6 dice pool narrative game. Think HeroQuest and Burning Wheel in the front, with a few indie games and WEG’s Star Wars D6 in the back, all in a car crash. Put back together by a games designer with an eye for simplicity and common sense. When Graham initially started the game he put a call out for people to write mini-settings called Themes for inclusion in the book. Four authors, my self included, answered the call. Graham published a plain text version , which included his Epic Fantasy theme, last year. His plan was to do a fully illustrated version with the remaining four themes. Unfortunately he hasn’t got time to do this due to other commitments, so I’m picking up publishing this. As well as Graham’s theme it will have; The Cold Crusade by Mark Galeotti (De Vinci code meets Heroes), Flashpoint by me (think Traveller redone as a story telling game), Infinite War (gonzo time travelling game, part satire of current war on terror, influenced by Jerry Cornelius and Fritz Leiber’s The Big Time), Keep Portland Weird by Charles Green (Charles calls it Urban Fantasy, but I think its very much World of Darkness done right with a lovely bit of surreal social commentary running in the back ground). “But Newt I notice only three authors there in your list” you cry. That’s right, Dom Mooney was originally going to be submitting ‘Singularities’, an epic Hard Sci-fi theme in the tradition of Iain Banks, Alistair Reynolds and a host of other modern writers, but is now developing it as a standalone Wordplay game. Apart from quickly writing Flashpoint, which is the replacement for Singularities, this is very much a quick layout job. I’ve already got alot of free/lo cost art from my regular stable of artists 🙂 Release then April. Dark Corners of the Empire: This is my own fantasy heartbreaker, written using Wordplay. Take the adventure and setting from OpenQuest and mash it up with the Wordplay system and see what comes out the other end. Its really intended for people who want to try Wordplay out, but are put off by its ‘hey make everything up yourself’ approach or just want to play it in a familiar fantasy setting. Release?? This one is coming together very quickly, so could be March or Feb. Hearts in Glorantha & Gloranthan Adventures: HiG was my starting point as a small press publisher almost two years ago. Its done me proud, providing me with a basic cash flow to pay for art for other projects. As a commited Gloranthaphile I’m still chugging away putting togehter the twice yearly HiG (issue 4 is being worked on now) and Gloranthan Adventures is an irregular spin off publication brought about by the realisation that I still have alot of my own material (which is mainly adventures) that is too big to fit in HiG. Monkey the begining of the End! Spent the last couple of days in a happy fug after finishing OpenQuest playing about with various projects, considering what to throw my seemingly the boundless energy into next in a very real get it done and out the door sort of way. Finally after banishing various niggling fears with a big hearty Brian Blessed laugh, I’ve settled on Monkey. The text is two thirds done, now all have to do is finish the rest. Art is in the bag courtesy of Jon Hodgson (Cover) and lots of lovely public domain pieces for the black and white (and possibly colour) internals. So time to get it on and finish my own personal Journey to the West. I now have a lovely cover for Monkey, done by the ace Jon Hodgson. Aiming for a July release.